Introducing Venus Heal™, now cleared in the U.S. for the treatment of minor muscle aches and pain, relief of muscle spasm, and improvement of local blood circulation. 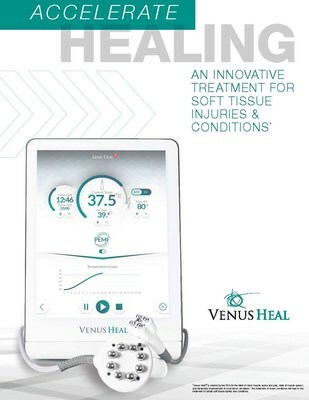 TORONTO, Feb. 5, 2019 /PRNewswire/ — Venus Concept Ltd., an innovative global medical technology leader, announces the launch of its latest medical device, Venus Heal™. With over 11,000 systems installed worldwide, Venus Concept has expanded their suite of leading medical devices and incorporated their most advanced technology into this latest innovation, intended for the accelerated healing of soft tissue injuries and conditions. Venus Heal™ is powered by RP3 technology, which synergistically combines the benefits of Multi-Polar Radio Frequency (RF), Pulsed Electro Magnetic Fields (PEMF), and massage. In addition to its compact and portable design meant to adapt to a specialist’s needs in-clinic or on-site, Venus Heal™ also includes advanced technological features for superior patient comfort and consistent treatment efficacy. Venus Concept® is a leading global medical technology company that develops, commercializes, and delivers safe, efficacious, and easy-to-use non-invasive technologies and related practice enhancement services in a unique, industry-disruptive subscription-based business model. Venus Concept’s devices have been designed in cost-effective and proprietary ways that enable the company to excel in multiple medical industries. The company has expanded its subscription platform and is now selling its devices in over 60 countries, including 27 with direct offices. Venus Concept has more than 400 global employees whose customer-centric approach has supported the company’s rapid growth. For more information, please visit www.venusconcept.com.